Bible studies for women have long been stereotyped as overly emotional and theologically shallow, following the assumption that women don’t flock to rigorous theological study and few women would be equipped to teach even if they did. Thankfully, this assumption is dying in certain women’s ministry circles. With the advent of the True Woman movement, and now The Gospel Coalition’s 2012 National Women’s Conference in Orlando, more resources by and for women are helping them study of the Bible. 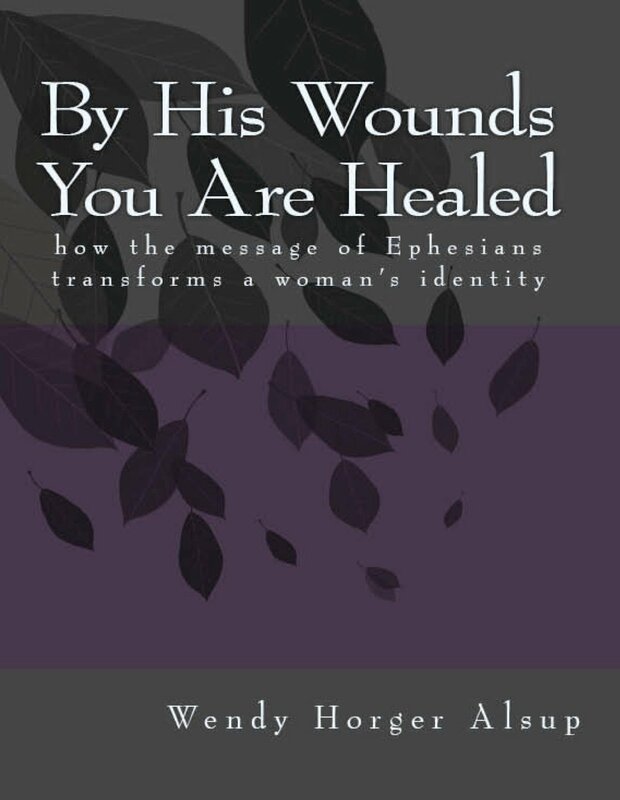 Enter Wendy Horger Alsup, author of By His Wounds You Are Healed: How the Message of Ephesians Transforms a Woman’s Identity. She is also the author of Practical Theology for Women, which was birthed out of a class she taught. Alsup wrote By His Wounds You are Healed to show Christian women their spiritual inheritance in Christ and the wealth of transformative grace available to them because Christ paid their debt on the cross (9). But this book is not for the faint of heart. She does not write to cater to emotions or the latest fad. She writes to help women see the wealth of truth written in God’s Word. While there are countless excellent commentaries and studies out there on the book of Ephesians, the benefit of this study is that it was written by a solid, Christ-saturated woman with the hearts of women in mind. Women need theology and in-depth Bible study just as much as men do. Alsup understands that and answers the call. The book is divided into four sections based on the distinct themes in Ephesians, going from the deeply theological to the practical applications of these truths. She is clear early on that the book is not a verse-by-verse commentary on Ephesians, but instead focuses on the message of Paul in the book of Ephesians by trying to give a cohesive overview of key themes and points. The length of chapters and detail is varied to meet this objective (9). The primary theme carried throughout the book is that we have a glorious inheritance in Christ because of his redemptive work on the cross. Her unpacking of how and why we receive this inheritance, as well as how this inheritance changes us, is really helpful (40-43). Ephesians 2:1-10 contains amazing truths about who we were before God in his great love and mercy rescued us and made us alive in Christ. This has tremendous implications for how we live. We can now “spend” our spiritual inheritance on good works that bring glory to the Father (43). Each chapter contains practical examples, based on the message of the text, which encourage thoughtful consideration of how our spiritual inheritance works out in our lives. Our spiritual inheritance in Christ should carry with it a desire to be with our spiritual family. Alsup writes in a way that assumes our involvement with the local church. She doesn’t write for the lone-rangers in Christianity. While she is realistic about the failings of the church, she doesn’t use these failings as an excuse to shun commitment to Christ’s body. Rather, she recognizes that it is within the context of the local church that we learn how to spend our spiritual inheritance and grow more in our identity in Christ. Ephesians contains some of the clearest passages on God’s view of the marital relationship, in addition to other key relationships. Alsup spends three chapters explaining the often controversial passage of Ephesians 5:21-33 (123-134). She helpfully dives into submission by providing sensitive encouragement for women who are, or have been, abused (123). Abuse is a sad reality in the church and in the greater culture. Often those who disagree with complementariansim have used abuse as a reason to discredit the entire position. Alsup seems to know this as she writes, and therefore she speaks clearly regarding the Bible’s teaching that submission is not subordination or servitude, or even a license for abuse. Instead, it is obedience to God by both the husband (the authority) and the wife (the one submitting) (123-126). By focusing on the greatest submission of all, Christ to the Father, she presents a bold vision for women that goes beyond the mere day-to-day operation of who makes the decisions. She is showing us that by submitting to our husbands we are emulating our Savior, who though he was equal with God laid his life down willingly to serve the Father’s great purpose of redemption (125). Like every good Bible study, this book includes discussion questions as you conclude each chapter. The chapters alone provide enough material to engage the heart and the mind, but the questions only solidify the truths represented. For women’s ministry leaders seeking a solid biblical study this would be a tremendous resource for the women of your church. Alsup gets to the heart of the sin issues that plague us as women. But she doesn’t end there. She gives us Jesus, the one who bought our inheritance by his precious blood on Calvary and gave us a new identity in him, because by his wounds we are healed. Editor notes: This study does not come with a separate leader’s guide but does have Discussion Questions at the back of the book that correspond to each chapter. It divides easily into an 8 or 10 week study. This review by Courtney Reissig was first posted at The Gospel Coalition. This entry was posted in Bible Studies and tagged Ephesians, Identity, New Testament. Bookmark the permalink.